If you’ve read anything that I’ve written this college season, you’ll notice a common theme of me really enjoying the 133 lb weight class. Well, this was the week that the weight class got turned on its head. 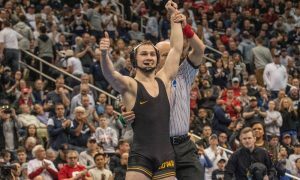 2018 NCAA Champion Seth Gross officially confirmed what many had feared; he would miss the remainder of the 2018-19 season due to injury. Two-time All-American Scott Parker did so as well, though I think more people saw it coming for him. On the mat, there were a couple of titanic clashes between top-ten ranked opponents. Even unranked Anthony Cefolo (Rider) made headlines by pinning high-flying Austin Gomez (Iowa State). It was anything but, business as usual, in the last week so let’s relive ten of the top performances of the past week. It’s not very common that teams are able to quadruple their previous season’s win total, but that is what Sacred Heart has done this year, with still more than a month left in the regular season and five dual meets remaining. Head coach John Clark’s team only won one match last year during his first season on the job, but already have four W’s on his record this time around. On Sunday, the Pioneers edged EIWA rival Franklin & Marshall 19-18 to earn their first conference win of the year. Sacred Heart jumped out to a 19-11 advantage after eight bouts and hung on to win despite losing the final two matches. Gerard Daly at 149 lbs picked up a major decision for SHU while 165 lber Brandon Levesque chipped in with a pin. Other Pioneer wrestlers that contributed with victories against F&M are Anthony Petrillo (133 lbs), Will Schmidt (174 lbs), and Kyle Davis (184 lbs). Sacred Heart will look to add to their win total with a Friday dual scheduled against American International. 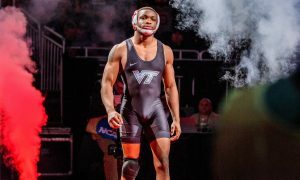 Most of the time in the top performances of the week, our focus tends to get drawn towards the underdogs and wrestlers that surprised us with an upset or two. 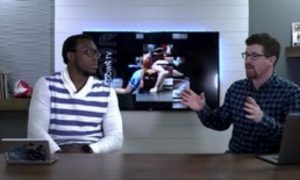 We might take a grappler like Jason Nolf for granted, but not this week. For the second consecutive week, Nolf was tasked with defending himself against one of the top three wrestlers in the nation and came through with flying colors. 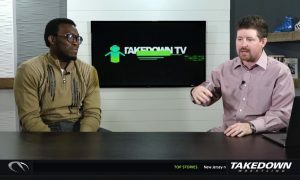 Last week, Jason went 2-0 with a major decision victory over third-ranked Ryan Deakin (Northwestern). This time around he was slated to meet second-ranked Tyler Berger (Nebraska). Even though his bonus point streak was snapped, (Nolf has previously earned bonus points in all 15 of his 2018-19 matches) Jason was never seriously threatened by the two-time All-American Berger and won comfortably 10-4. Lost in some of the shuffle with all of the freshman 285 lbers that are making an impact is Central Michigan’s, Matt Stencel. After having to injury default out of the Midlands quarters, Stencel returned and pinned three of his next four opponents on his way to a third-place finish, in a loaded bracket. Two of his pins came over much ballyhooed true freshmen Anthony Cassioppi (Iowa) and Mason Parris (Michigan). Since the Midlands, Matt has continued to stay hot. He has gotten his hand raised in each of his last three duals after the tournament, including two this weekend. The first was another fall, this time over another true freshman, Junior World silver medalist Zach Elam (Missouri). Yesterday saw, Stencel pin Colton McKiernan (SIU Edwardsville). Quick, name the three remaining, undefeated 141 lbers…I’m sure you probably got Yianni Diakomihalis (Cornell) and Joey McKenna (Ohio State), but did you remember Bryan Lantry? Admittedly Lantry has missed some duals and tournaments for the Bulls, so his record now sits at only 7-0, but it is his most recent win which should open some eyes. During Buffalo’s 19-12 win over Old Dominion, Lantry not only picked up a win over returning All-American Sa’Derian Perry, but he also did so with an 11-3 major decision. Bryan is a two-time NCAA qualifier that made it to the Round of 12 in 2017 while wrestling at 133 lbs. He has twice been a MAC runner-up for Bulls head coach John Stutzman. 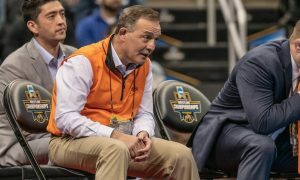 Campbell is a program on the rise under Cary Kolat and it seems as if every time you look the Camels are establishing new program bests or firsts. Sunday’s 19-17 win over SoCon rival Appalachian State marked the first win for Campbell over the Mountaineers during Kolat’s tenure. The win was the first conference victory of the year for Campbell (also first conference match) and puts them in the driver seat for the SoCon. The match itself was a nailbiter with four bouts that went into overtime. ASU took an early 10-0 lead after three matches, but the Camels battled back to make the team score 17-15, in favor of App State, heading into the final match at 174 lbs. Junior Andrew Morgan came through with a 15-4 major decision over Thomas Flitz to give his squad the outright win and maintains Campbell’s 3-0 record on the season. 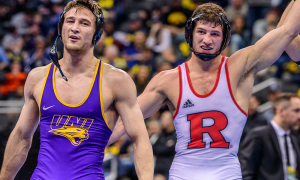 In one of the biggest matchup of the week, sixth-ranked 141lber Mike Carr squared off with number five ranked Mitch McKee (Minnesota), during a Big Ten dual. 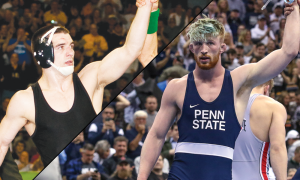 Both wrestlers are returning Round of 12 finishers from a year ago that are looking to not only get onto the podium for the first time, but also shock the title favorites (Diakomihalis, McKenna) along the way. It was the Illini’s Carr who came out on top in a bout that included some high-quality scramble to down McKee 5-2. Mike may have flown under the radar a bit, as he missed one dual meet and did not compete in the Midlands, so he only has wrestled in nine matches this season. Both losses on the year have come to the same opponent, two-time All-American Jaydin Eierman (Missouri). Speaking of Mizzou, despite the loss of All-American Grant Leeth to injury, the Tigers have chugged along seemingly not missing a beat after pulling Brock Mauller’s redshirt. A pair of wins last week has brought Mauller’s record to 22-1 overall and he is 9-0 in duals since coming out of redshirt. 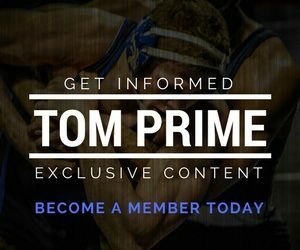 During Thursday night’s huge dual with Northern Iowa, labeled TOM’s Dual of the Week, Brock faced the toughest test of his freshman campaign with 2017 All-American Max Thomsen, currently ranked ninth in the nation at 149 lbs. Mauller took the match 9-3 in stunningly smooth fashion. He was even able to get a set of back points off of a nifty tilt. To cap off his week, Mauller scored a 9-5 win over Dresden Simon (Central Michigan), helping push Mizzou’s dual meet winning streak to 33 in a row. Brock’s only loss of the season came to 2018 NCAA Round of 12 finisher Jarrett Degen (Iowa State), a wrestler he has also defeated this year. 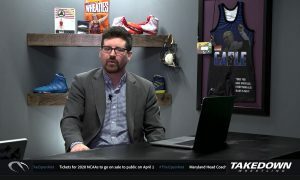 The biggest upset in the Missouri/UNI dual didn’t belong to Mauller it was by Northern Iowa 141 lber Josh Alber, who knocked off the third-ranked Eierman, 4-3. The two met twice last season and the Tiger took both of those matches, one of which came by fall. This time around, Alber was able to stay out of any unusual situations that would favor the unorthodox Eierman. Alber ended his weekend with a 5-0 shutout of Garrett O’Shea (Air Force). The win over O’Shea now brings Alber’s current winning streak to 10 matches, after losing to Diakomihalis in mid-December. Two weeks after that match, Josh captured his first Midlands crown, with a win over in-state rival Max Murin (Iowa). Another week, another NCAA finalist downed by Austin DeSanto. 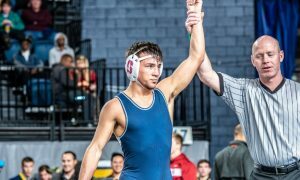 Last week DeSanto earned a spot in the top performances by dropping Ethan Lizak (Minnesota) in surprisingly dominant fashion. This time around it was Nick Suriano (Rutgers) who fell victim to DeSanto, 6-4. Austin controlled the pace and positioning in the match and along with a boisterous home crowd at Carver-Hawkeye Arena, forced Suriano to wilt as the match progressed. A takedown at the edge of the match, as the final seconds on the clock were expiring, gave DeSanto the win. Austin has now won eight matches in a row, after suffering his only loss of the season to Austin Gomez (Iowa State) in early December.